The Esplanaadi Puisto represents the best qualities of Helsinki City – it is a park, surrounded by public functions, which connects important locations within the center of Helsinki: it stretches from Erottaja Square to the Market Square (Kauppatori), and then extends north along the side of the Market Square to the Katajanokka Channel. 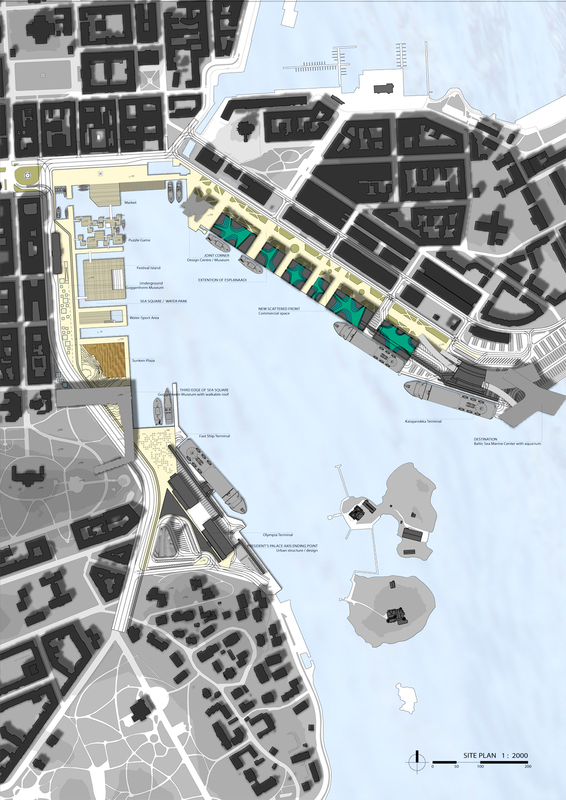 The proposal for the South Harbor extends the Esplanaadi to the south, trying to accomplish the continuation of the Esplanaadi’s unique qualities by adding a destination, surrounding it with public functions, and making the street into a park. To start with, the proposal deals with the Sea Square / Water Park, located on axis with the Esplanaadi. It is an existing void with two clearly defined edges – one in the north and one in the east. 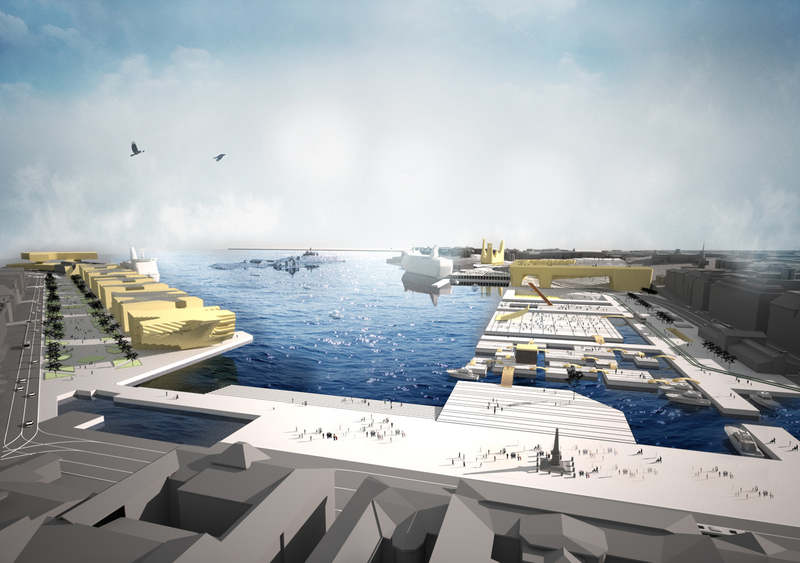 The proposal adds a straight geometrical volume to the Sea SQUARE to form a third edge, while leaving the fourth side open to let it serve as a destination for those entering Helsinki by sea. After doing this, the proposal focuses of the following 4 entities: 1) the third edge of the Square – the Museum, 2) the Square, 3) the Eastern Shore, and 4) the Destination Endpoint of the Esplanaadi. The Destination Endpoint has to be a building that has enough attraction to activate the southern Esplanaadi, and would be best served by a public function that is visited regularily by citizens of Helsinki. 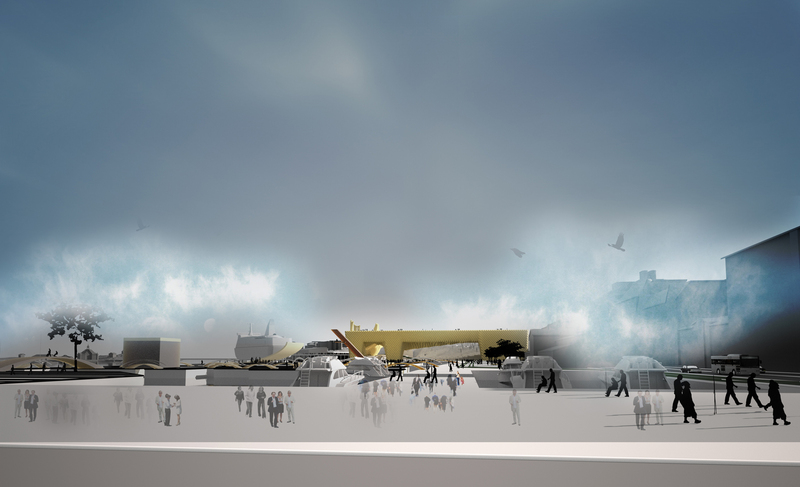 A “visit-once-and-never-come-back” museum is not enough: the building must provide pedestrian public space that is free and multilayered, should able to provide vehicular access to the ferries, and be oriented to the sea and the arriving ships. 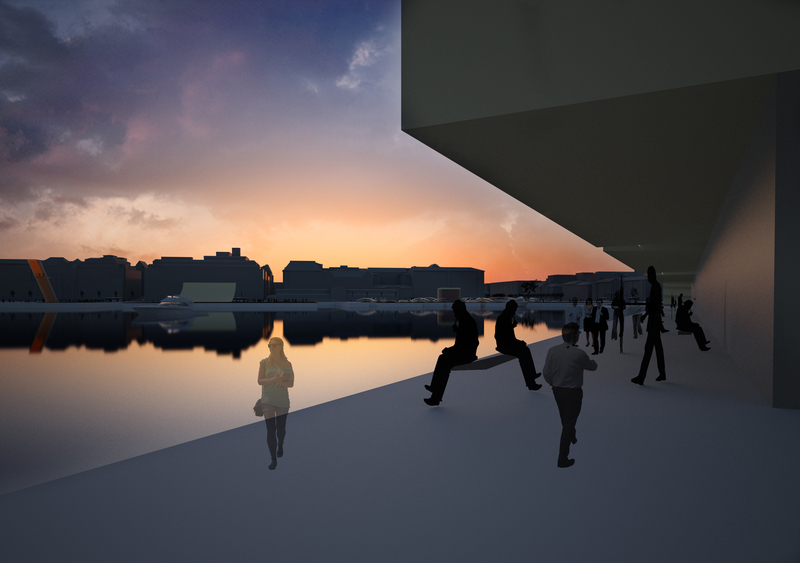 It can become, for example, a Baltic Marime Centre with an aquarium. The Square is a part of the triptych of nature: esplanade, water-park, Tähtitorni mountain. 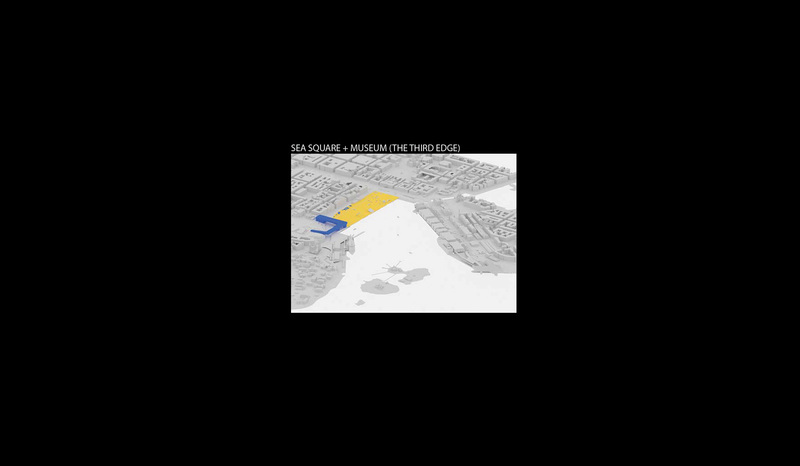 The Square is a metaphorical “window” to the sea for Helsinki, Finland and the Finnish people – it could be a “place of identity”. The Square is where the sea ends and Helsinki begins, a place where regular organisation of culture starts to dominate over the chaos of the seascape. The Square is vast: it has its characteristic scale and form which is specific to Helsinki. It is present already without the west edge but articulation brings it out. 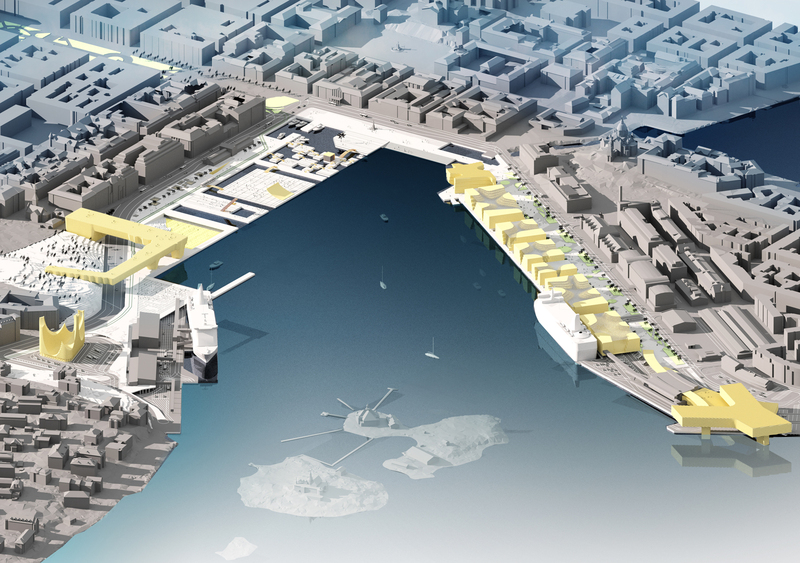 Merging the water and the city, it creates numerous possibilities for the programme asked by the people of Helsinki. 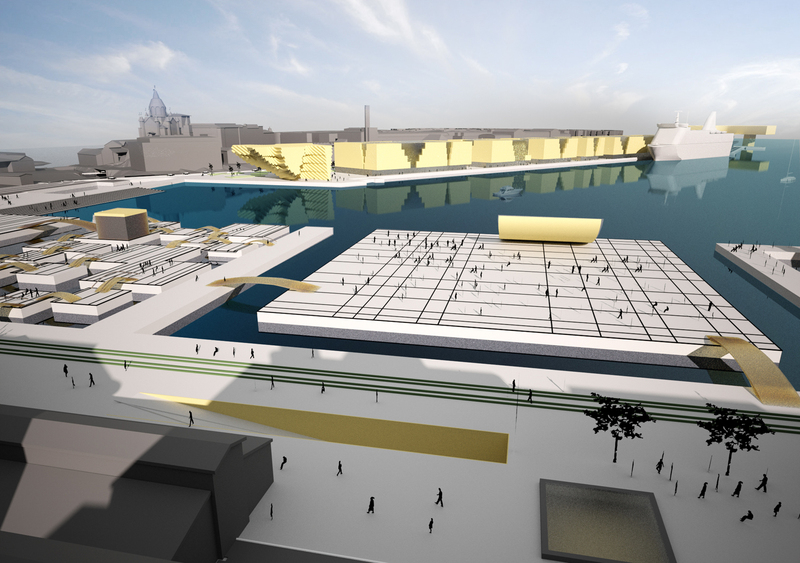 For illustratory purposes, the proposal divides the Square in four parts: a sunken plaza, a water-sport area, a festival square, and a puzzle game. All the parts might be filled / refilled / de-filled with needed smaller objects. Helsinki differs from many other European capitals of having water in three different states: vapour, liquid and solid. Water park would be a playground for them all pushing kamos out of the “playground” during winter. It might be the appropriate place for showing off the benefits of the Finnish society and it’s high-tech accomplishments: above the Square on calm nights there could be a “cloud of digital poetry”. View from the president’s palace is preserved. 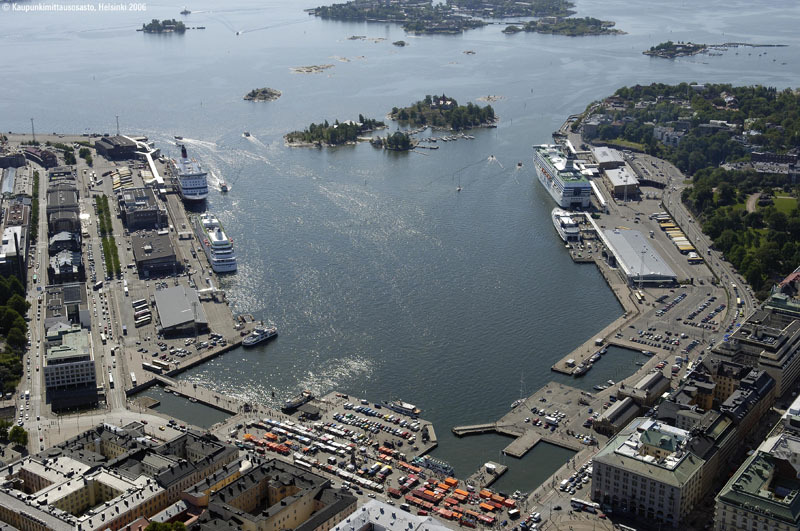 The Square serves as a port for Suomenlinna-ferries, fishermen’s boats and other smaller servicing boats and letting in different kind of water-activities … merging it with solid ground and floating rafts. In addition, the Square can continue to serve as a market-place. The Eastern Shore consists of a row of city blocks which preserve the view from the new Esplanaadi to the sea and ships. The pedestrian promenade just on the seashore supports the possibility for docking smaller ships or even floating docks. 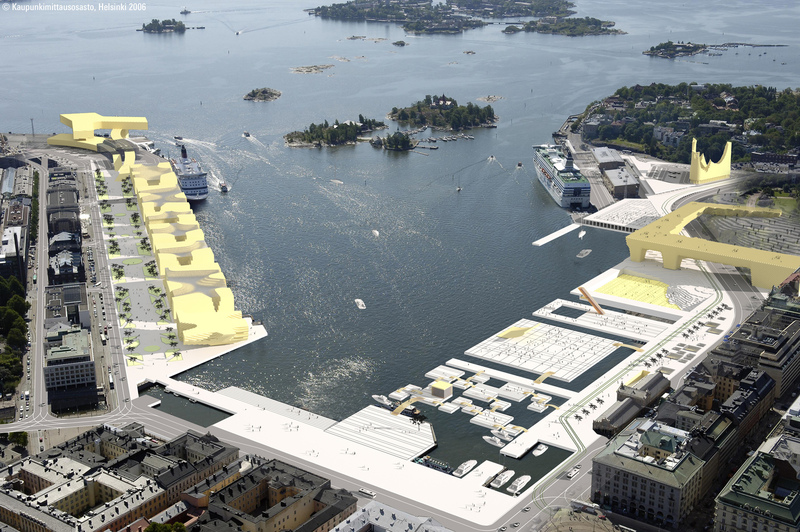 Some commercial space is needed to activate the street but it might start with a Finland’s Design Center and Museum. The east side of the promenade has a continuous front, while the west boasts a playful elevation for different sea views and views towards the Tähtitorni mountain. The whole renewed and redefined space is anchored by three buildings: two bigger structures that are a Museum (Guggenheim?) 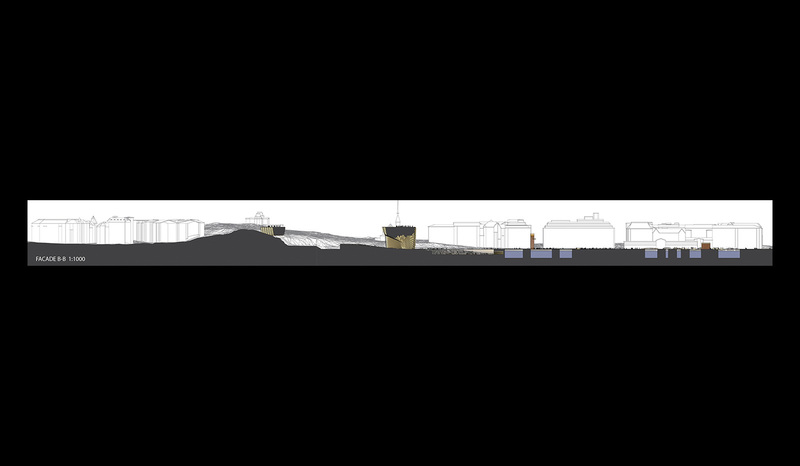 and a Baltic Marime Sea Center, and a smaller building located at the junction of the Main and Southern parts of the Esplanaadi, which could be a Design Center and Museum. Two of them – “design center” and museum – form a smaller part of Helsinki’s new “living room” with it’s rectangular grid and freely forming activities. The Museum building is lifted up in the air to “let the sunshine in” to the Square; to open up space for continuous “mountain slide” to the very bottom of the sunken plaza paved with existing solid rocks, gravel and sand creating a “nature park” and an entrance to the museum’s continuation under the streets. 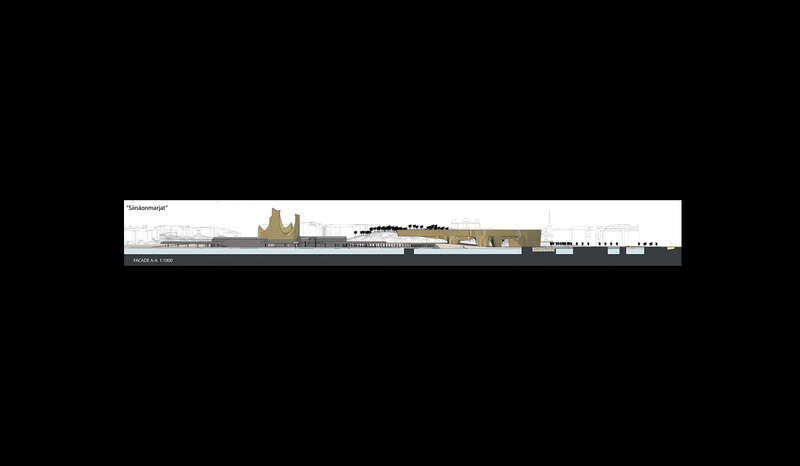 Hill side of the Museum should be with blurred edges; provide connections for climbing up to the top of the roof to have vista-terraces. All in all it might be the place and possibility for showing off the benefits of Finnish society and it’s so far successful mingling with high-tech games – up above the Square on calm nights there is seen a cloud of digital poetry. Due to the remaining on the same location of the two ferry-boat terminals the main road system remains unchanged, except in front of Eteläranta, where the cargo traffic might use the same route as the public traffic because shifting the tramlines allowed for extra space. Bigger parking lots are kept on ground level, but covered by second floors of buildings above. Parking areas are also widened underground to the vicinity of Ehrenströmintie. The junction in front of the Olympiaterminali is pushed towards the Laivasillan Puistikko to facilitate underground cargo traffic and to clear the ground in front of the terminal. This new triangle ends the axis starting from the president’s palace. 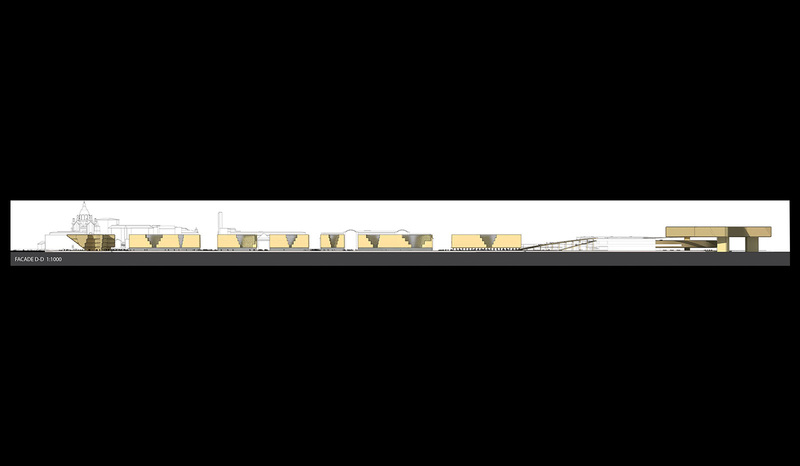 Speed ferries terminal is located on the northern edge of this two-layer hybrid, while the urban design/structure/building mentioned above creates a focus point on the end.